Last Friday the global climate conspiracy erected another plank dressing up the façade that is record of warming record in Australia. At an extra-ordinary nerdfest held the Victorian State Library, the cruel manipulations of temperature records by the Bureau of Meteorology were described. ACORN-SAT, I mean, really! Lies dressed up as statistics were outlined to an audience who hung on every word. The conspirators have done such a good job that the Australian record so closely resembles the tricked up records from Hadley-CRU, the Goddard Centre for Space Studies and NASA, that they all have to be made up. There’s no way that independent analyses of measurements of something we can’t see – air – can be so accurate. Well, that’s the objections of the denialati out of the way. The BoM did release The Australian Climate Observations Reference Network – Surface Air Temperature (ACORN-SAT) data on Friday and it looks excellent. Today I’m downloading some of the data for a project I’m involved in, so it’s good to have. The data were also used in the recent State of the Climate 2012 released by the Bureau and CSIRO. Part of the impetus to get this done was a barely coherent set of assertions on how Australia’s climate records were being massaged by the Bureau. These assertions were formally submitted (pdf) as a request to audit climate records to the Attorney-General in February 2010. Co-signees were Senator Cory Bernardi, Joanne Nova (an alias), Andrew Barnham, Anthony Cox, James Doogue, Chris Gillham, Ken Stewart and Dr David Stockwell. They also alleged that BoM and CSIRO advice on climate change was misleading. This follows up similar fishing expeditions in New Zealand and the US yielding similar results. Not only were the records validated, quality control methods and subsequent adjustments improved those data giving us even more confidence that the record of warming they contain is unimpeachable. Improved methods, external international review and a more comprehensive coverage have led to the Bureau to claim they have the some of the best quality records of temperature of any country. I think they’re right. Two technical reports have been produced describing the process in addition to summaries on the BoM website: one on the quality control process and the other on comparisons between composite records. Tens of thousands of individual records were flagged and each checked. Station changes, suspect trends, step change analysis to identify inhomogeneities were all carried out. Pairwise comparisons between individual stations with up up to 40 neighbours were performed. Improved adjustments to account for station moves were undertaken – not just an average change but at 5-percentile intervals from the 5th to the 95th percentile to capture the full range of potential exposure to changes. For example, warm extremes are unlikely to be affected in the same way as cool extremes when a station moves from one location to another. Comparisons between different data sets were also made. In Australia between the ACORN-SAT, the same data splined to allow for altitude (curved across topography), the raw data and the AWAP (Australian Water Availability Project) data. Internationally, the data were compared with Hadley-CRU, GISS and NASA data. The following chart shows a high degree of agreement between all those records. 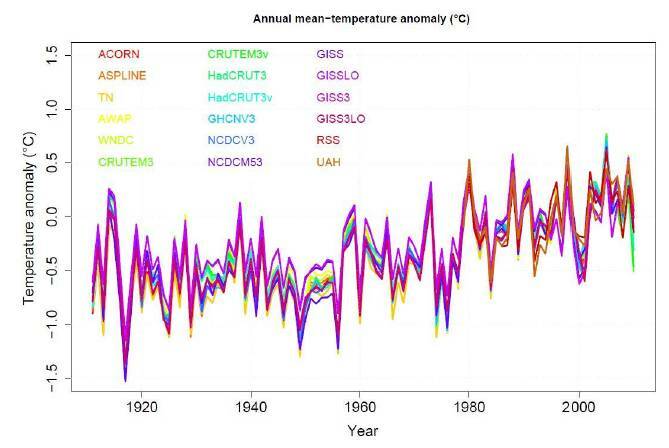 Temperature comparisons between the ACORN-SAT and a range of other Australian and international records of continental warming for Australia from 1910. This won’t stop the nasturtiums of denial being flung at Australia’s temperature records but they should re-assure the truly sceptical that while the data aren’t perfect (none is) they’re pretty good. Which just go to show, its possible to get air temperatures wrong, in many areas and ways….so these measurements just wont wash. None of them are capable of showing margin of errors!